Apple has been rumored to be seriously considering a folding iPhone/iPad device. Today, the company was granted a patent by the USPTO that is titled "Electronic devices with flexible displays." Originally filed on June 8, 2016, the patent mentions a transparent display that bends in the middle using "grooves or other recesses." When the screen is folded, there is an area of the screen that gets thinned on the display layer. 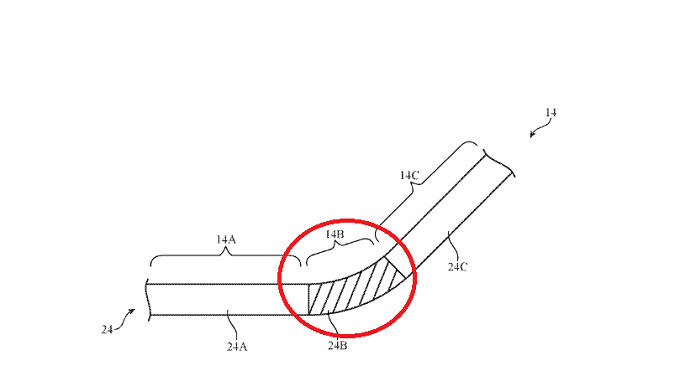 To prevent this thinning, which can cause havoc with the display, the patent discusses the use of filling the recess area in the middle with "Elastomeric material, fluids and other materials." The patent, US10,020,462, is credited to Jiang Ai, Erik A. and Soyoung Kim. Back in March, Merrill Lynch analyst Wamsi Mohan said that Apple is working to produce a folding iPhone for 2020. You might recall that back in October 2017, there was talk out of Korea that Apple has given LG the job of producing a foldable OLED panel and circuit board with the goal of releasing a foldable iPhone in, yup, 2020. You have to love it when two separate rumors months apart have the same timeline. The rumored folding iPhone will turn from a handset into a tablet-like device. Check out images from the patent at the top of this article, and in the slideshow below. I don’t think any company should rush this. I am speaking to all manufactures. They were so gung ho about making flexible screens without having a good use for it well except for Apple and certain companies that wanted to make their displays a little tougher. There is a difference in rushing an end product and rushing tech itself. There is nothing wrong with pushing the boundaries of tech. This way we get progress, just make sure people are ready for the tech they invent. Isn't that's already patented? How is it not, everyone has been aiming for it. I think that’s the key - make the screen surface durable enough to withstand constant bending. Lol headline should read: Apple patents foldable display and waits for makers to finish their products. Yeah, it's just another ambiguous doodle patent from apple, just for excuse to sue other.